The Entrepreneurial and Development Conference and Expo, or EDCE, is Canada’s only national conference for small business owners. By entrepreneurs for entrepreneurs, EDCE provides real world applicable content with keynotes from international business experts. A complete business development conference, EDCE offers tools in sales, marketing, social media, business growth, financing, and strategy; making EDCE Canada’s #1 business conference, tradeshow, and networking event for business owners & executives. So you’re attending the conference on November 18, but what should you expect? Speakers – Entrepreneurs, CEOs, Politicians, Emmy Award Winners, & much more. Susan Wilson Solovic is an award-winning entrepreneur, New York Times and Wall Street Journal bestselling author, media personality, and attorney. Susan has spoken to thousands of small and mid-sized businesses around the globe and helped many build multi-million dollar businesses with her proven strategies from the trenches. Think managing a business is difficult, try a city! Mayor Bowman, former chair of the Winnipeg Chamber of Commerce, has proven his ability to promote economic growth with active business development strategies. Brian Bowman can turn vision into action, which has had a positive impact for the City of Winnipeg. Our very own Sylvain Marcotte started 14 Oranges back in 2009 as a weekend side job. Fast forward two years and 14 Oranges is an award winning mobile app company providing mobile applications across North America. 14 Oranges now provides applications for large governments such as the City of Surrey and City of Richmond, and major U.S. associations. Sleepless nights paid off for Sylvain and 14 Oranges, be sure to catch his story at EDCE Winnipeg. Valuable, pitch-free content—the EDCE Trademark. With over 20 seminars and workshops to offer over Nov 18-19, you’re sure to sharpen your skills in social media, sales, marketing, funding, and more. Each session is educational and provides tools and knowledge that will help you grow your business. EDCE content will keep you educated on the latest insights to help your business achieve maximum return on investment. Attendees include business professionals, managers, presidents, and entrepreneurs. Each attendee will leave with skills that they can apply the very next day! Welcomed with open arms and big smiles, EDCE Winnipeg provides a second to none experience for motivated professionals. 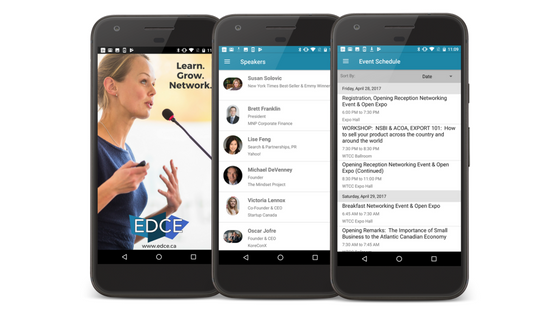 Mobile App – With the EDCE mobile app, attendees will have all the weekend’s information in the palm of their hands. 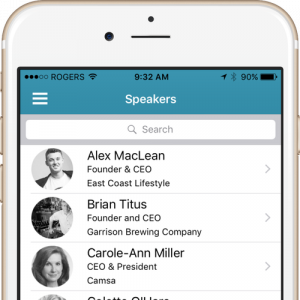 With speaker bios, conference schedule, and tradeshow items, the mobile app is every attendee’s personal guide for the weekend. Make sure you download the EDCE for iPhone or Android before you attend! Networking – Meet potential customers, vendors, friends, and colleagues at EDCE Winnipeg that will help grow your business. The event schedule and conference will allow you to maximize your time networking and meet the people who are important to you. Trade Show – Whether you leave buying a new product or not, each exhibit and sponsor will keep you up to date with emerging technologies and trends. According to EDCE, “91% of attendees say they get the most useful buying info from conferences and 81% say that conferences help them become aware of new products and services.” Be sure to stop by 14 Oranges’ product booth to learn more about Info Grove Mobile Applications. From everyone at 14 Oranges Software, we look forward to seeing you on November 18 at EDCE Winnipeg!